If the euro crisis has had a paradoxical impact on European views of minorities – high profile anti-immigrant, anti-Semitic incidents but also some sympathy for the targeted groups – the political consequence of the severe economic downturn has been clear: rising public support for nontraditional political parties, fueled mostly by anti-EU, anti-austerity populist sentiments. The depth, magnitude and length of the economic downturn in Europe led to a precipitous drop in public faith in the European project, loss of trust in European institutions, voters turning out numerous national governments, and the emergence of populist parties on both the left and the right that attacked the European Union. New parties in Spain and Italy opposed the EU’s imposition of fiscal austerity. In France and the United Kingdom, fear of Brussels’ centralizing tendencies fueled the rise of already established right-wing political parties. In Germany, critics of the EU objected to the bailouts of other financially troubled members. The electoral significance of these nontraditional, Eurosceptic parties has only begun to be tested. The United Kingdom Independence Party, UKIP, which advocates their nation’s departure from the EU, captured nearly 13% of the vote in the May 2015 British parliamentary elections, making UKIP the third most popular party in the country. Yet UKIP won only one seat at Westminster. In the first round of local elections in France in March 2015, the Eurosceptic, right-wing National Front garnered 25% of the vote, coming in second behind the center-right UMP party and just ahead of the ruling Socialists. But, by the second round, it gained less than 2% of local council seats. The National Front favors leaving the Eurozone and is critical of immigrants. Podemos is a left-wing Spanish party that has called for a renegotiation of EU-demanded fiscal austerity measures and a curbing of EU powers. Founded in 2014, its candidates received 8% of the vote in that year’s European parliamentary elections. In the May 2015 local elections, Podemos came in third place nationally and gained control of Barcelona in a power-sharing deal with another party. Alternative for Germany (AfD) is a conservative, Eurosceptic party founded in 2013. It won 7% of the vote in the 2014 German elections for the European Parliament, capturing seven seats. It also gained seats in five German state parliaments in 2014 and 2015. The party is opposed to the euro, but not explicitly anti-EU or anti-immigration. The populist, environmentalist Eurosceptic Five Star Movement in Italy favors a national referendum on abandoning the euro and returning to the lira. In the 2014 European parliamentary elections, it gained 21% of the vote and 17 members, making it the second-largest Italian party in the European Parliament. The conservative, economically libertarian Congress of the New Right in Poland received 7% of the vote in the 2014 election for the European Parliament, winning four seats, one of which has joined the Eurosceptic group in that legislative body. The rise of these populist, generally Eurosceptic political groupings on both the left and the right is largely a post-euro crisis phenomenon. Their long-term impact on the future of European politics will depend on their ability to broaden their electoral appeal. One measure of that potential is the public’s sense of whether or not the rise of these nontraditional parties has been a good thing for their country. Half or more of the public in four of the six EU nations surveyed voice the view that the emergence of these populist parties has indeed been a good thing. The French think it has been a bad development, and the Poles are divided. Seven-in-ten Spanish believe that the rise of Podemos has been beneficial. Men are more likely than women to say this. Not surprisingly, Spaniards on the left of the political spectrum are much more likely than people on the right to be of the opinion that avowedly left-wing Podemos is beneficial to Spain. Roughly two-thirds of the British (66%) voice the view that UKIP is good for the United Kingdom. Men are more supportive of the party than women. People ages 50 and older more than those ages 18 to 29 favor UKIP, and, as might be expected, people on the right share this view more than those on the left. A majority of Italians (58%) believe that Five Star is good for Italy. This is particularly the case for young and middle-aged Italians and those on the left. The rise of AfD is viewed as a positive development in Germany by half of the public. This is the view of men far more than women and Germans who identify themselves on the right rather than the left. The Poles are split over the emergence of the Congress of the New Right party. Roughly a third of them (36%) think it has been good for Poland, 39% believe it has been bad and 25% voice no opinion. Men more than women say the rise of New Right is a good thing. Around half of young Poles (52%) but only roughly a quarter of older Poles (27%) say the rise of this nontraditional party is positive. The National Front’s surge in recent French elections has not been well-received by the general public, despite its electoral success. Fully 63% of the French hold the opinion that the National Front’s success has been bad for France, while just 36% believe it has been good. 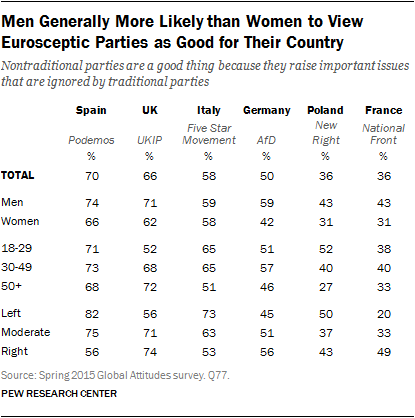 Women more than men say the party’s rise has not been good for France, as do, overwhelmingly, people on the left. But even people on the right end of the political spectrum are split about the National Front’s benefit to France.